Introducing… Sgt. Pepper’s Sunday at No.6. We’ve dedicated the final day of the festival to celebrate the 50th anniversary of Sgt. Pepper’s Lonely Hearts Club Band, featuring the Royal Liverpool Philharmonic Orchestra & The Bootleg Beatles on our main stage, a Sgt. Pepper’s themed carnival, pop-up immersive performances, live spectacles, installations, talks, screenings from Culture Liverpool and Beatles surprises across the festival site, all inspired by the seminal album. In the No.6 Academy on Saturday, world-renowned producer Steve Levine will talk to British Music Experience head curator Kevin McManus about the incredible production work on Sgt. Pepper’s by Sir George Martin, who he first worked with 40 years ago. Also, the brilliant Dr Mark Vernon talks about The Philosophy of Friendship inspired by With A Little Help From My Friends and The Psychology of Love, based on All You Need Is Love (not on Sgt. Pepper’s, but released during the Summer of Love). Also on this bill is an incredible Sgt. Peppers-themed Carnival No.6, (Being For The Benefit of Mr. Kite) offering you the chance to bring your own Sgt. 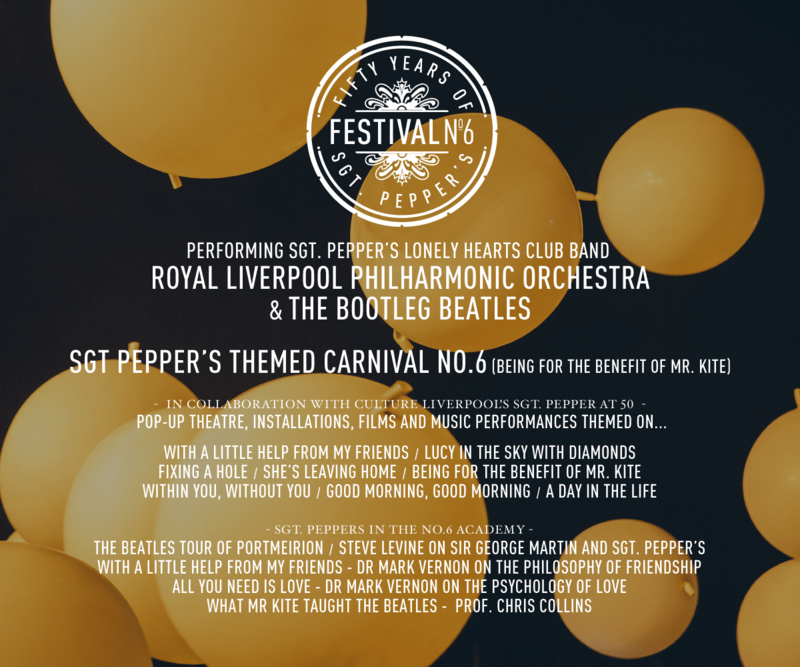 Peppers themed costumes and join the carnival as it weave its way through the village to the main stage in time for the 70-piece Royal Liverpool Philharmonic and The Bootleg Beatles amazing performance of Sgt. Pepper’s in full, and The Beatles Story’s Liverpool Selfie Photo Board – choose your favourite Beatle, take a selfie and share across socials with a hashtag, #SgtPepper50.